JAGER Technologie GmbH was founded as an engineering company in 1994 by an experienced team drawing on know-how acquired in large enterprices. JAGER Technologie GmbH offers tailored solutions with its qualified knowledge in the above industries. The original founders and today's managing directors accompany and take care of every project in their own responsibility. born in 1960, studied electrical engineering in Osnabrück and was 8 years working as a project engineer at Lurgi AG in Frankfurt/Main. In 1994 Raymond founded the JAGER Technologie GmbH in Bad Homburg. Besides his work as managing director, he is still actively involved in the project execution. born in 1965, studied electrical engineering in Frankfurt and was 4 years working as a project engineer at Lurgi AG in Frankfurt. 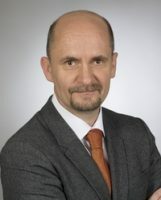 Thomas is co-founder of the JAGER Technologie GmbH. JAGER Technologie GmbH • Schoene Aussicht 8a • D-61348 Bad Homburg v.d.H.